Tickets: $15 (previews) — $35 (savings available for seniors & students). Visit www.thepear.org or call 650-254-1148. 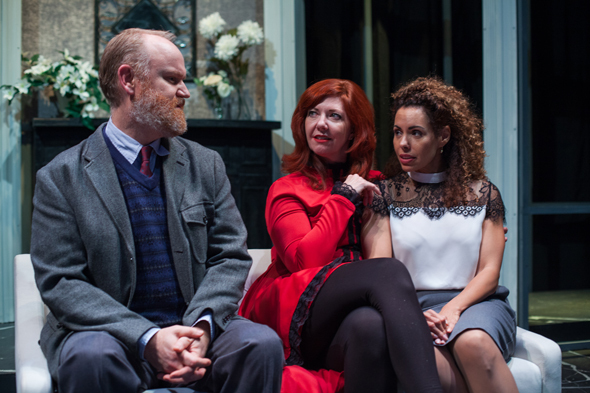 Michael Champlin as Eilert Lovburg, Betsy Kruse Craig as Hedda and Damaris Divito as Thea Elvsted, from left, in "Hedda Gabler" at The Pear Theatre. The show runs October 12-28, 2018. Henrik Ibsen's 1891 drama "Hedda Gabler" is getting a truly impressive production at The Pear Theatre in Mountain View. Betsy Kruse Craig, artistic director of The Pear, is powerful as the title character, which is considered one of the great dramatic roles. And, dressed in gorgeous costumes, she is surrounded by an excellent cast, on a huge, beautiful stage. The Pear has gone all out on this production, which uses a script adapted by Pear founder Diane Tasca, from the translation by Edmund Gosse and William Archer. Scenic designer Ting Na Wang created a fabulous set, that stretches the length of the Pear auditorium, with the theater's movable seating lined up on either side of the long length, which makes it feel rather like theater in the, uh … rectangle. If seated at either end, good luck hearing all the dialogue and seeing all the action. Still, it's beautiful, with very impressive faux black-marble flooring, as might be found in a pricey mansion. The furniture is modern. In 1891, there were no clear acrylic chairs. 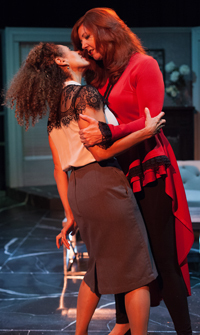 Damaris Divito as Thea, left, is bullied by Hedda, played by Betsy Kruse Craig. Both are excellent in "Hedda Gabler." 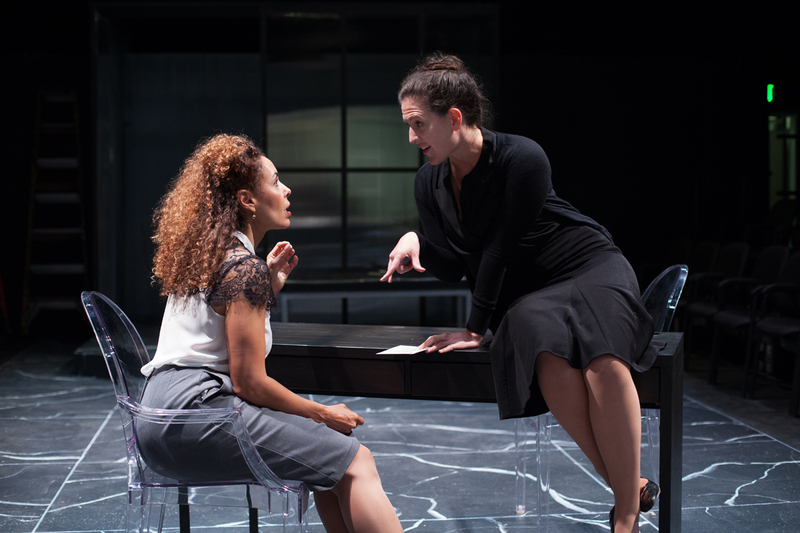 The interplay between Kruse Craig's Hedda and Damaris Divito's Thea Rysing Elvsted is riveting. Divito is fairly tall, by normal standards, but Kruse Craig is at least six feet tall, and towers even higher thanks to heels. As Hedda stomps across the stage in one of her many hissy fits, then cruelly confronts Thea — whom she had regularly tortured when at school — it makes for a lot of drama. Divito's Thea is scared and mousy, under the thumb of the powerful Hedda, unhappy in her marriage and in love with a man she has no way of knowing that Hedda already wants. Beautiful, much-desired Hedda is recently wed and honeymooned, to a bookish professor, George Tesman. She is finding him a disappointment. She wants to solidly influence someone's life, and she wants a rich life, but George is too wrapped up in his research to even pay attention to Hedda, and isn't as successful as she would like him to be. Troy Johnson is excellent as George, a nice guy who'd probably want to help Hedda be happy, but just can't get his nose out of books and papers. 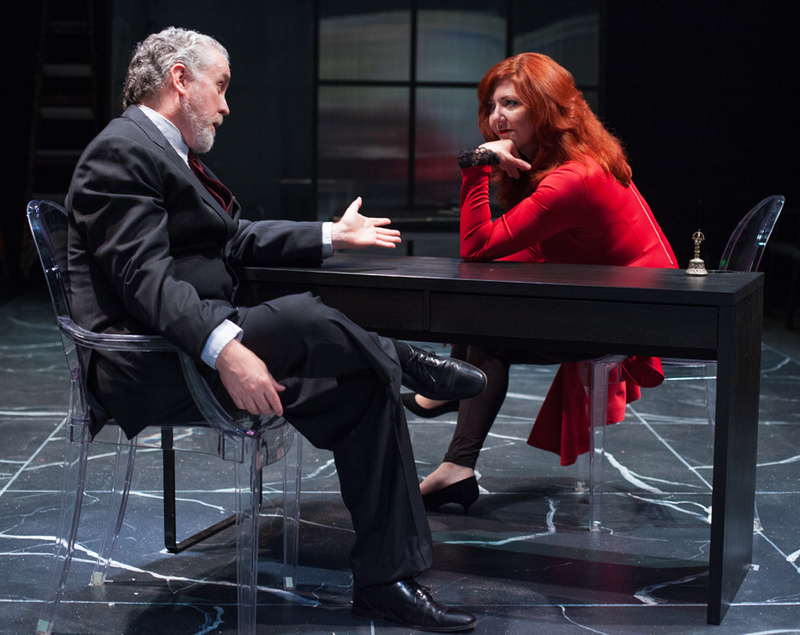 Rob Talbot is a sly hedonist, Judge Brack, who oozes immoral desires for Hedda. Michael Champlin is Eilert Lovborg, who loves Hedda, and who is loved by Thea. Champlin does an excellent job of carrying Eilert from hopeful sobriety to drunken ruin. Celia Maurice, wearing the ugliest hat ever seen in the entire history of theater (at least in the first act; after the intermission, she gets to wear something more handsome), is all loving concern and genteel graciousness as George's aunt, Juliana. She elegantly represents a sort of society mores that are of no interest to the selfish Hedda. Gretta Stimson is fine in the smaller role of Berta, "the servant." Hedda, desperate to stave off her selfish boredom and put some thrills in her life, is horrid to Thea and then to Eilert. The play does not end happily for anybody. I don't like the play itself, for some of the same reasons I don't like the movie "Thelma & Louise." Both this play and that movie posit that women can never be happy in a world dominated by men, and their only option is to kill themselves. Hedda is selfish to the point of sociopathy, and isn't remotely appealing, other than for her beauty. And Kruse Craig, with her long auburn hair and shapely body, wearing fabulous costumes by Melissa Sanchez, is certainly beautiful. In "Thelma & Louise," the two women set off on an adventure, but are chased by police and cheated by evil men. Zoom! Off the cliff they go in a 1966 Thunderbird that lacks wings. In "Hedda Gabler," Hedda isn't abused (although Judge Brack would probably like to do so), but she just doesn't get the kind of attention she thinks she wants, and has too little character herself to actually accomplish something. In the 1890s there were lots of women who accomplished things — Harriet Beecher Stowe, Elizabeth Cady Stanton, Susan B. Anthony, Florence Nightingale and Harriet Tubman, to name a few — so it wasn't the lack of opportunity or cruel men that kept Hedda from being a decent person. It was Hedda herself. Ron Talbot as Judge Brack, left, wants more than just friendship with Betsy Kruse Craig as Hedda at The Pear Theatre. The show runs October 12-28, 2018. 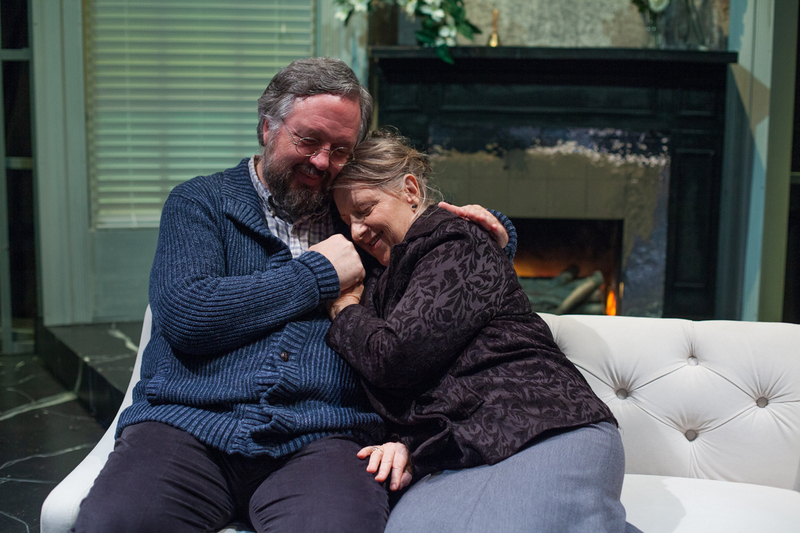 Troy Johnson as George Tesman, left, and Celia Maurice as George's aunt Juliana Tesman, in "Hedda Gabler" at The Pear Theatre. The show runs October 12-28, 2018. 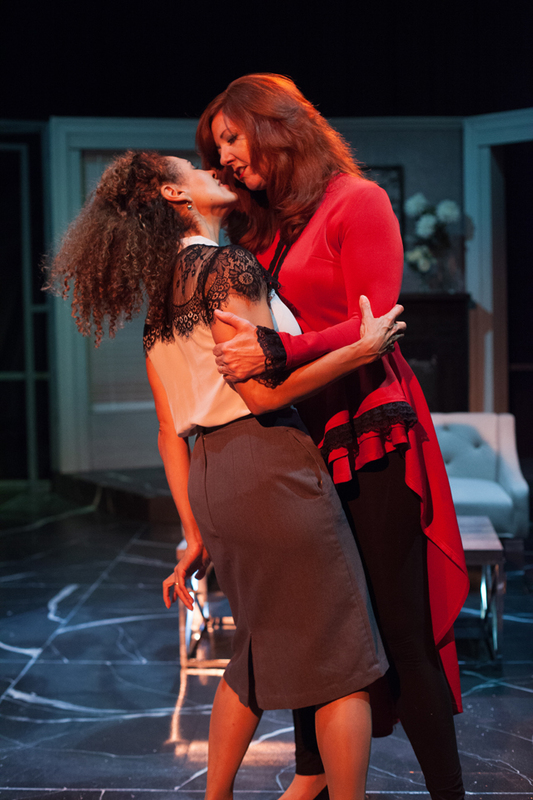 Damaris Divito as Thea, left, with Gretta Hestenes-Stimson as Berta in "Hedda Gabler," which runs October 12-28, 2018, at The Pear Theatre.